Sri Ganesha, the son of Shiva and Parvati, represents knowledge and removes obstacles. He is worshiped at the beginning of all auspicious activities. Although Lord Ganesha is known by many other attributes, Ganesha’s elephant head makes him easy to identify. Ganesha is widely revered as the Remover of Obstacles and more generally as Lord of Beginnings and Lord of Obstacles (Vighnesha, Vighneshvara), patron of arts and sciences, and the God of intellect and wisdom. He is honored at the beginning of rituals and ceremonies and invoked as Patron of Letters during writing sessions. 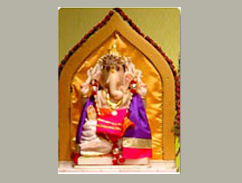 Sri Ganesha brings good luck, removes obstacles and bestows prosperity to worshipers. Lord Shiva appears in a meditating but ever-happy posture. He has matted hair which holds the river Ganges. Shiva’s attributes represent victory over demonic forces and calmness of the human nature. His vehicle is the bull, Nandi. Shiva Linga, sign of Shiva, is very often worshiped instead of him. Vishnu is the Supreme God in the Hindu religion. He is the Paramatma (supreme soul) and Parmeshwara (supreme God). Vishnu is the master of the Universe and the creator and destroyer of all existences, one who supports, sustains and governs the universe and originates and develops all elements within. Vishnu is the peace-loving deity of the Hindu Trinity, He is the Preserver or Sustainer of life with his steadfast principles of order, righteousness and truth. When these values are under threat, Vishnu emerges out of his transcendence to restore peace and order on earth. 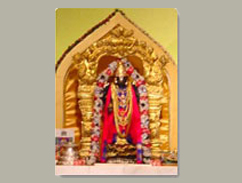 Sri Rama is the seventh incarnation of Lord Vishnu. 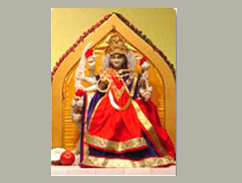 He represents an ideal man, as conceived by the Hindu mind. He is depicted as the perfect son, devoted brother, true husband, trusted friend, ideal king, and a noble adversary. Rama is shown carrying a bow and arrow, which convey that Rama is always ready to destroy evil and protect righteousness. He is himself an embodiment of dharma. His consort, Sita, symbolizes an ideal daughter, wife, mother, and queen. She represents all that is great and noble in womanhood. She is revered as an incarnation of Goddess Lakshmi, the divine consort o f Lord Vishnu. Lord Krishna is the most commonly worshiped deities in the Hindu faith. He is considered to be the eighth avatar (incarnation) of Lord Vishnu. 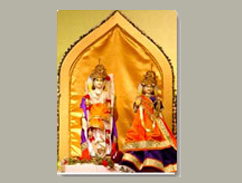 He, like Lord Rama, is known for his bravery in destroying evil powers throughout his life. Lord Krishna is usually depicted as playing the flute (murali), indicating spread of the melody of love to people. 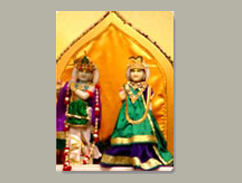 He is also shown with his childhood devotee Radha. The Lord is usually remembered and worshiped as Radha-Krishna. The pair symbolizes the eternal love between people and god. Lord Krishna gave mankind the gift of the Bhagwad Gita, which is a holy book in Hinduism. 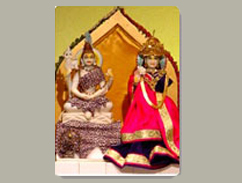 The worship of Goddess Durga is very popular among Hindus. Goddess Durga represents the power of the Supreme Being that preserves moral order and righteousness in the creation. Durga also personifies ‘shakti'(energy). Durga, the Divine Mother, protects mankind from pain and suffering caused by evil forces such as selfishness, jealousy, prejudice, hatred, anger, and ego. She has a charming personality and is worshiped by women, who ask her blessings for a happy married life. Sri Hanuman is worshipped either alone or together with Sri Rama. Sri Hanuman was the Avatara of Lord Siva. He was born of the Wind-God and Anjani Devi. He is also called by the names Pavanasuta, Marutsuta, Mahavira, Bajrangabali and Pavankumar. 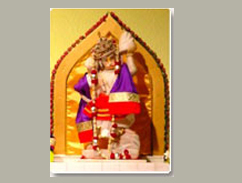 Hanuman is a noble hero and a great devotee of Rama. His eternal devotion to Sri Rama has earned him a place of high esteem in the eyes of all Hindus. He is the provider of courage, hope and devotion. He did what others could not do—crossing the ocean simply by uttering Ram-Nam, burning the demon-king’s city of Lanka, and bringing the sanjeevini herb to restore the life of Lakshmana. He brought Sri Rama and Lakshmana from the nether world after killing Ahiravana.